Obtaining Florida RV Insurance Online is easy with Click & Save Insurance. Find the most affordable Florida Recreational Vehicle Insurance available based on your driver profile. Our team of insurance professionals are here to assist you. Call us today at 1-813-643-7770 for all of your Florida Insurance Services, or click here. When researching Florida RV insurance , you will need to consider what type of vehicle you want to insure. While many auto insurance companies provide RV insurance, you need to be clear on what you are covering: a RV / motor home or travel trailer. 110 – 125 volt electrical system. Travel trailers and campers are non-motorized and are typically towed. To qualify for travel trailer insurance, you may be required to have a Cooking facility and sleeping area permanently attached. Protect your valuable investment. 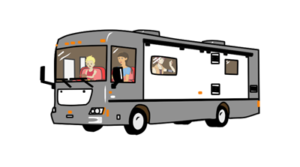 You will lose financially if something happened to your RV and you are not properly protected. With Click & Save, you can buy the best protection you possibly can at the best price you can get. When researching Florida RV Insurance Quotes, don’t assume your auto insurance covers your recreational vehicle. Florida is a no-fault auto / RV insurance state. No fault limits your right to sue an at-fault driver after an accident. No-fault coverage (also referred to as personal injury protection or PIP) applies to medical expenses after an accident. PIP does not apply to property damage. If you’re injured in a covered accident, personal injury protection (PIP) can pay up to 80 percent of your injury costs, and up to 60 percent of lost wages. PIP coverage can also help pay for substitute services like cooking and cleaning, if you are unable to perform regular household tasks. Can I sue at-fault drivers for my medical expenses? Despite being a no-fault state, Florida drivers can still sue an at-fault driver for medical expenses after serious accidents. Lawsuits can be filed if the accident resulted in disfigurement, fatal or permanent injuries. Bodily injury liability coverage helps protect at-fault drivers if a lawsuit is filed. Consider consulting a Florida Injury Attorney for suit related questions. Optional coverage will give you added financial protection in the event of an accident resulting in a claim. What is Florida’s Proof of Auto Insurance Requirements? Florida Drivers can provide proof of insurance with either a paper or digital copy of their auto insurance card. You could receive a fine Florida if you’re pulled over and unable to provide proof of Florida Auto Insurance Coverage. According to the Insurance Research Council, nearly 24% of Florida drivers are uninsured. That is almost double the national average. Uninsured motorist coverage is optional. However, if you’re in an accident with an uninsured or under-insured motorist, this policy option helps pay injury and property damage costs for you and your passengers.